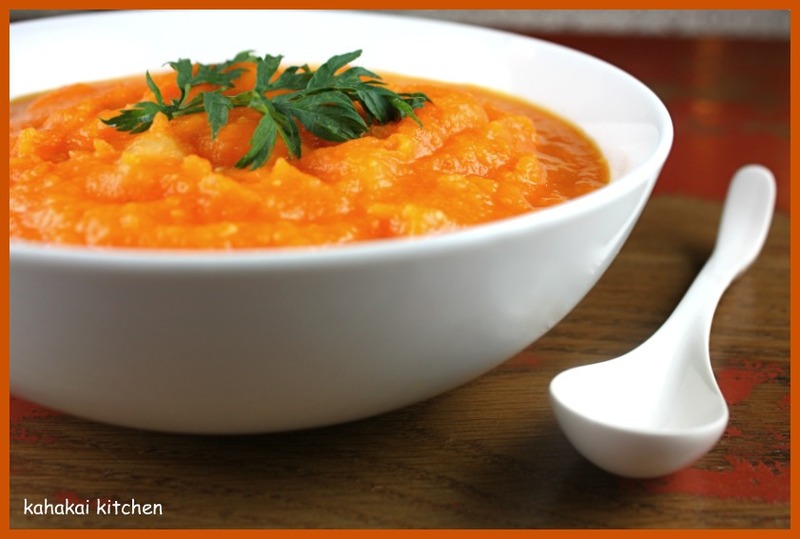 We are making all things orange this week at I Heart Cooking Clubs. 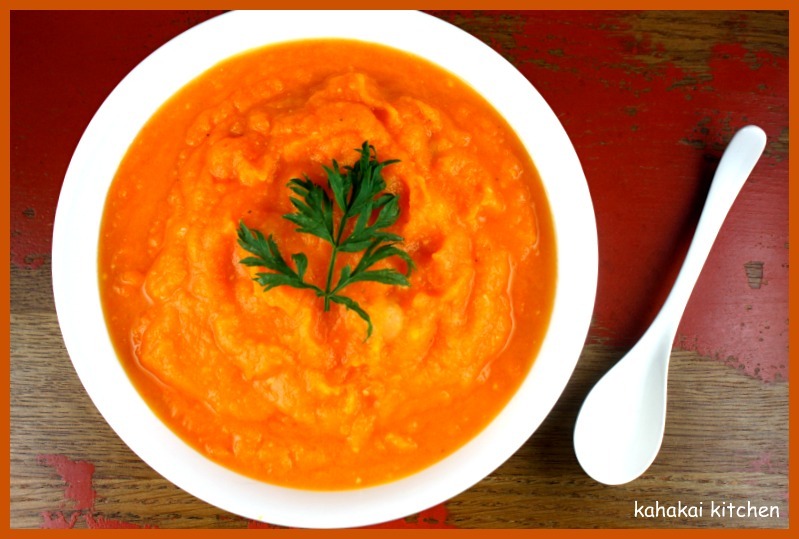 I am a day early with this sunny orange-hued Carrot Soup. This one is simply flavored, thick, sweet and creamy and reminiscent of a potato-leek soup. Wonderful fall comfort food fare. Tessa Kiros says, "I have seen rice added to this, but I actually love this simple recipe that is creamy, soft and sweet from the carrots. The soup will look as bright and healthy as the carrots you start off with. If you like, you can add a beef bone at the start for flavor. You can use a good stock cube or make a vegetable stock by simmering a peeled onion, carrot, celery stock and seasoning in about 4 cupfuls of water for a awhile." Halve the leeks and slice them up thinly. Put them in a bowl of water, slosh them around with your hands to make sure there is no grit inside, and then drain them in a colander. Heat the olive oil in a large wide pot and sauté the leeks until they are soft and starting to turn golden, but take care that they don't darken too much. Add the garlic and cook until you start to smell it. Add the carrots and turn through the oil. Add the hot stock and some salt and pepper and bring to a boil. Cut the potatoes into big chucks and add to the pot. Bring back to the boil, then reduce to a simmer, cover the pot and cook for about 40 minutes. Turn off the heat. Ladle out 2 heaped slotted spoonfuls of mainly potatoes and some carrots (trying to leave everything else behind as best you can!) and set aside. 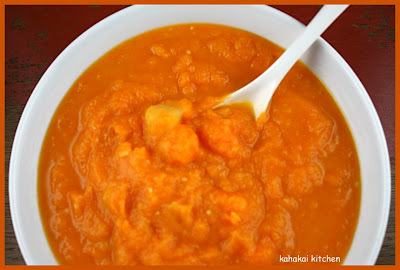 Puree the soup in the pot until smooth, adding a dash of extra stock or water if it seems too thick, then stir the unpureed potato and carrot back into the soup. Taste for seasoning before serving, or leave for a while and reheat gently. Notes/Results: A pretty color and a tasty bowl of soup. I used some small organic carrots that were fresh and sweet and I think Kiros is right that the fresher the carrots the better. I found the recipe to be good as written but I felt that it needed just a little brightness so I added the juice of a lemon which perked it right up. Warming, hearty and makes the most of a few simple ingredients, I would make this again. You can check out what dishes the other IHCC participants are making for the Orange Skies theme by going to the IHCC site and following the links. Let's see who is in the kitchen for the Souper Sundays roundup this week. 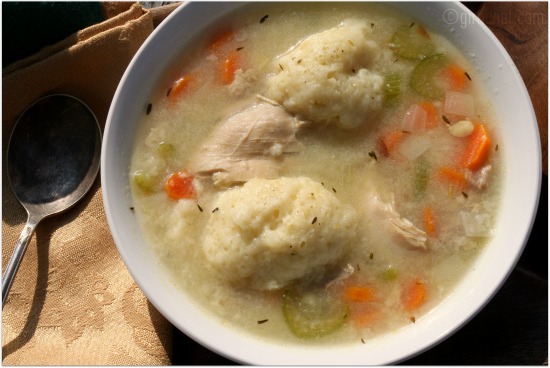 Heather of girlichef has some comforting Chicken and Dumplings to share and says, "Just as it should be, this is a big pot full of goodness and comfort. I used buttermilk in place of regular milk which gave the big, fluffy biscuits a pleasant tang. I also cut back on the celery and added garlic. Because really, what's a bowl of comfort without a bit of garlic!? Lastly, I left the chicken on the bones until after cooking to add extra flavor to the broth...and because I was too lazy to de-bone it before putting it in the pot. ...it's delicious, homey, and sure to ease the symptoms of a cold, a bad day, or a broken heart." Susan of The Well-Seasoned Cook made a spicy bowl of Miso Shikataki Noodles with Edamame and Shichimi Togarashi Seasoning. 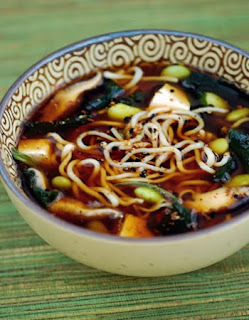 She says, "This was our Saturday night slurpy supper, a classically healthy Japanese broth-based bowl filled with innumerable soy-based ingredients that take it over the top for legume-centrity. Easy, naturally vegan and gluten-free, as well as very low in carbs, it warms the bones and soothes the hackles after a long day of obligations and futile attempts to squeeze more minutes out a clock that can only register sixty." Welcome to a new face at Souper Sundays, Cook@Vatsalas from Daring Cook at Will, joining us for the first time this week with a healthy Red Cabbage and Curd/Yogurt Salad. 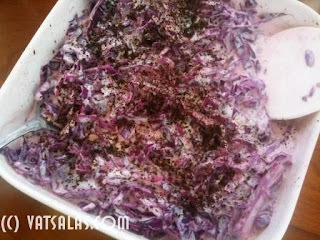 Vatsalas says, "We ate this salad at a Turkish restaurant and loved it. I think they add some cream to the salad but I decided to make it with curd and added freshly ground cumin for added flavor. I served this as a side dish and added left overs to our tofu sandwiches for another meal. Yum either way ..:) Best part about this recipe is its very simple and takes almost no time to prepare and fun dish to surprize your guests." 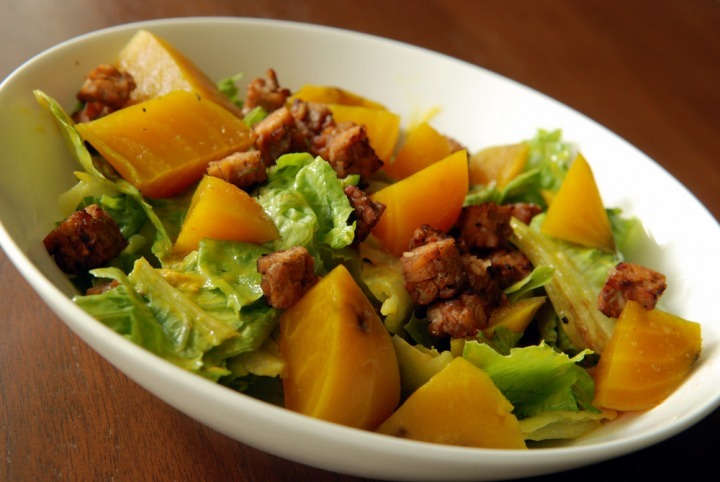 Janet from The Taste Space tried this colorful Roasted Yellow Beet Salad With Warm Maple Mustard Dressing and Smoky Tempeh Croutons and says, "It can be difficult to make a complete meal if you are famished after a long day at work…. unless, you have the forethought of making all the components ahead of time! I found this delicious salad at Post Punk Kitchen. I know it looks like another crazy multi-component salad: roasted beets, smoky tempeh croutons, a warm maple mustard dressing. Trust me, the best dishes get you to bring out the best of each component. Work on the weekend for each component, then bring it all together mid-week." 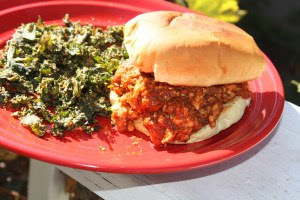 Finally one sandwich this week from Elizabeth at The Law Student's Cookbook who enjoyed these hearty Turkey and Mushroom Sloppy Joes that she served with some kale chips she won in a giveaway. She says, "I received the kale chips last Tuesday and decided to serve them with my sloppy joe lunch. Basically, it was pieces of kale, that some process was done to them to get them crispy coated with a soy cheese substitute and garlic. They definitely weren’t the same as potato chips and I don’t know if they could satisfy my potato chip cravings, however, they definitely were yummy." Thanks to everyone who joined in this week. If you have a soup, salad, or sandwich that you would like to share, just click on the Souper Sundays logo for all of the details. great round up and love the color of your soup! That is absolutely captivating! The color is so gorgeous, I can't stop staring! And I'm sure it's so delicious that once I started, I wouldn't be able to stop eating! Definitely orange! Looks wonderful! My daughter and I LOVE soups!! I love the color of this and the fact that it looks so darn hearty! I think adding the potato to thicken it up is a winning idea. Looks delicious. 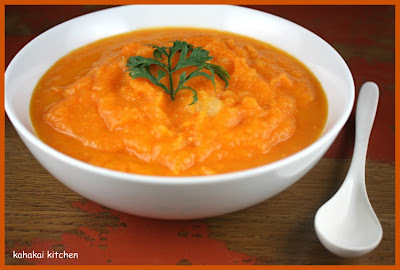 It's been a warm fall, but the weather has finally turned cool, just in time for me to use lots of Souper Sunday recipes! Love the color of that soup! Such a pretty bowl of soup. I agree, that little splash of lemon just wakes everything up...never without lemons in my kitchen, they are staples as far as I am concerned. I don't have Piri Piri and have been holding off...but this sure looks good. That is a lovely and yummy bowl of soup! Love the gorgeous orangey colour! Thanks so much for your SSSSSs, Deb. What great showcases for easy meal ideas. They're all wonderful. Now that soup season's here, I hope to join in more. Your carrot soup is so cheery and healthy, and a good excuse for me to purchase one of Kiros' cookbooks. She's one food writer who hasn't yet found a home here.